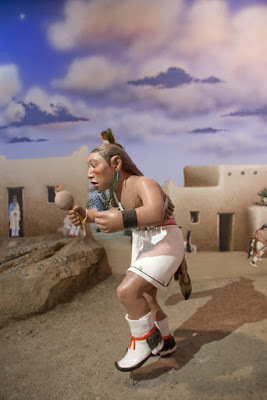 The Poeh Cultural Center and Museum is located about 16 miles north of downtown Santa Fe, NM, at the Pueblo of Pojoaque. 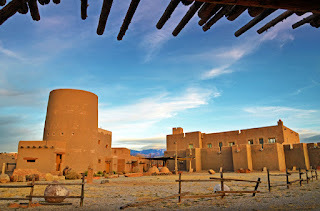 The Center was designed to resemble a traditional pueblo with its collection of golden adobe buildings arranged around a series of open plazas. The beautiful architecture is more than just for show. The Center has been used as a training project for teaching traditional construction methods in partnership with the tribally-owned Poeh Pueblo Construction Services Corp. The construction training program is just one of several projects designed to further the Poeh Center's mission of preserving Pueblo culture and language, promoting artistic expression, and educating both tribal members and non-natives. Although visitors are probably focused on touring the small but well-designed museum and visiting the gift shop, the Center is also home to the Poeh Arts educational institute which includes studio space for local working artists, classes, and an internship program for tribal members who are interested in arts and museum administration. Research archives provide online access to some of the Museum's collections, a photo archive that includes over 10,000 historic and contemporary photographs, and the Oral History Documentation Project. Online access is available by request. More programs are in the works, such as a children's museum, an amphitheater for lectures and dance exhibitions, a larger library/archive facility that would include the Pojoaque Public Library, and a garden. Already, the Museum has been expanded to include space for artist demonstrations, a gift shop, and a rotating exhibit gallery in addition to the permanent exhibit, Nah Poeh Meng. The word Poeh is the Tewa (one of five Pueblo languages, and the one spoken at Pojoaque) word for "path" and Nah Poeh Meng means "Along the Continuous Path." The imagery of time and culture as a leading path can be found throughout the Center, including the upcoming temporary Pueblo embroidery exhibit, "Paths of Beauty," which opens August 20, 2015. Nah Poeh Meng leads guests through Pueblo history in six temporal or "seasonal" spaces from the Pueblo origin story to the modern day. The Pueblo people tell this history from their own perspective through art and sculpture made by local artists and storytelling presented as audio in seven languages: Tewa, Tiwa, Towa, Keresan, Zuni, Spanish, and English. The Tewa recordings provide more detailed information for tribal members to have a deeper educational experience with their own culture and "to protect sensitive portions of Pueblo culture." 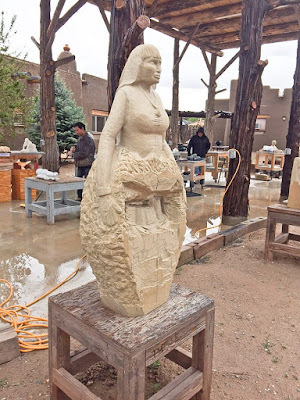 Adding to this examination of the broader Pueblo culture, the current rotating exhibit, "Everything and Everybody," presents the history of the Pojoaque Pueblo specifically. Beyond the Poeh Center, local art is on display via a self-guided tour at the nearby Buffalo Thunder Resort Casino. The Pojoaque Pueblo also offers several tribally owned restaurants, another casino resort called Cities of Gold, a Hilton Homewood Suites, an RV park, a spa, and a golf course. Guests are welcome during Pojoaque's feast days for Our Lady of Guadalupe on December 12 and July 27, as well as at the King's Day dances on January 6.